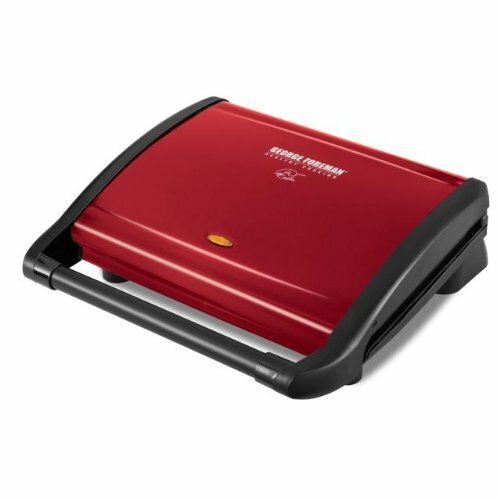 The 120 square inch cooking surface of the George Foreman Grill lets you grill up to eight servings at once. The double nonstick coating allows you to cook healthier without oil or butter, to prevent sticking on delicate foods like fish and veggies and minimize scrubbing to make cleanup a snap. Just plug in, preheat and you're ready to start grilling up all your favorite foods with less fat and more flavor. An optimized grilling angle allows fat and grease to drain off, for healthier meals and less smoke during cooking. Plus, the extended cool-touch handle offers easy opening and closing during cooking, with no need to touch heated metal grill surfaces.